Alright class, are we all together now? Each of you has followed directions and created your own sourdough start using potato water and sugar. Last time we met, Mrs. Titus told us that she made bread on the trail using her start to make a sponge. At left, we find a little more detail about making bread from a sponge, taken from The Great Western Cookbook, or Table Receipts Adapted to Western Housewifery by Mrs. A.M. Collins (1857). Collins calls for using yeast, but your starter already has yeast. Mrs. Collins also assumes that the reader knows enough about bread-making to know how to make a sponge into dough. Modern readers are probably less familiar and will require more specific directions. A more simple application of sourdough might be the "cakes" or biscuits that Mrs. Titus described. Once again, Mrs. Collins left us an interpretation of chemically-leavened biscuts, at right. In this receipt, Mrs. Collins illustrates the state of technology of her day: there was no "baking powder"-- instead she mixes soda with cream of tartar. The acid of the tartar activates the base of soda. Mormon pioneers also used soda to make biscuits. 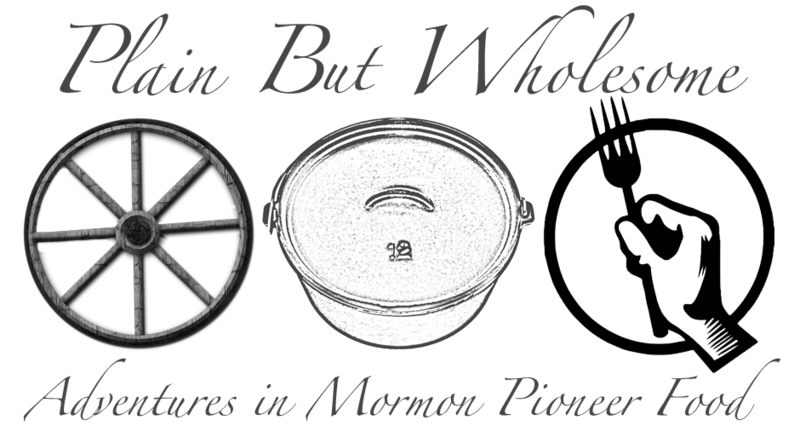 The "Mormon biscuits" that show up in so many volumes of Mormon cookery are simply soda biscuits with an ego attached. To make these with sourdough, we eliminate the "cream tartar" and "pint of warm water" and instead add two cups of the sourdough start. The start has a naturally acidic character, to activate the soda. The start is also liquid in nature, so we don't need water to mix the dough. Some bakers like to let the biscuits raise for 30 minutes after cutting them out; others put them to the oven immediately.